Boston, MA (May 28, 2018) – Synova Associates, LLC, announced this year’s winner of the RISING STAR award at the annual NICU Leadership Forum, held in Ponte Vedra, Florida at the TPC Sawgrass Marriott. This year’s winner was Anna Werner from Kootenai Health in Coeur d’Alene, Idaho. The Rising Star Award was created to honor Sandy Chapman, a retired founding Synova partner, for her commitment to mentoring young leaders and helping them develop into the leaders of our future. Qualifications for the award requires that the winner serve in a leadership position for a period of up to 3 years. 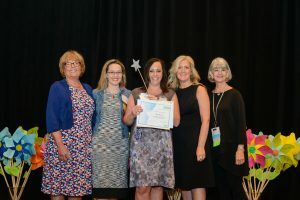 The selection criteria includes being an active participant in the NICU Leadership Forum; facilitate a 15 minute presentation; be an active member of at least one of the meeting committees; is not a previous award winner; attends all sessions of the conference; and finally, demonstrates exuberance and commitment by actively participating in meeting activities with a friendly, engaging approach. The award winner receives free tuition at next year’s NICU Leadership Forum. “We are so pleased to award Anna with Synova Associates NICU Rising Star designation,” said Chrissy Burke, Partner, Synova Associates. “She is truly deserving of this award particularly because of her consistent demonstration of commitment and support to her colleagues and her profession,” she said. Synova Associates NICU leadership forum draws nurse leaders from all over the country to meet, exchange ideas, network and share best practices. It’s the only nurse leadership conference of its kind and has been catering to the nurse leader community for close to 20 years. Synova Associates was formed in 2010 by Cathy Bush, Chrissy Burke, Sandy Chapman and Barbara Greer who have been organizing the NICU Leadership Forum meeting since its inception in 1996. Synova’s goal is to provide innovative solutions for nurse leaders through education and consulting services.